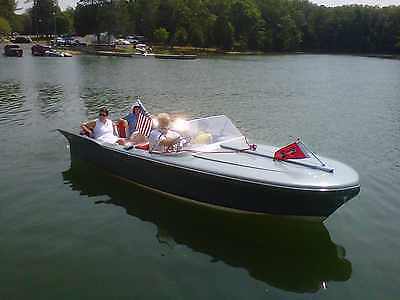 HERE WE HAVE A RARE & RESTORED 1959 CHRIS CRAFT 19' SILVER ARROW, #31 OF 92. THE SILVER ARROW IS THE MOST DESIREABLE & RARE COLLECTIBLE BY CHRIS CRAFT DESIGNER DON MOTRUDE. THE COMPLETE 3+ YEAR RESTORATION INCLUDED: REBUILD V8 - 312 CU IN @ 195 HP CHRIS CRAFT MARINE FORD INTERCEPTOR ENGINE, EXTENSIVE STRIP>PREPARATION>REFINISH OF THE PHILIPPINE MAHOGANY CONSTRUCTED HULL, AND REFASTENING OF THE DOUBLE PLANKED BOTTOM. THE TRAILER, AND A NEW CUSTOM SUNBRELLA MOORING COVER ARE INCLUDED IN THE AUCTION. PROFESSIONAL QUALITY RESTORATIONS TYPICALLY, TAKE 3+ YEARS, AND COST A MINIMUM $75K-$100K. 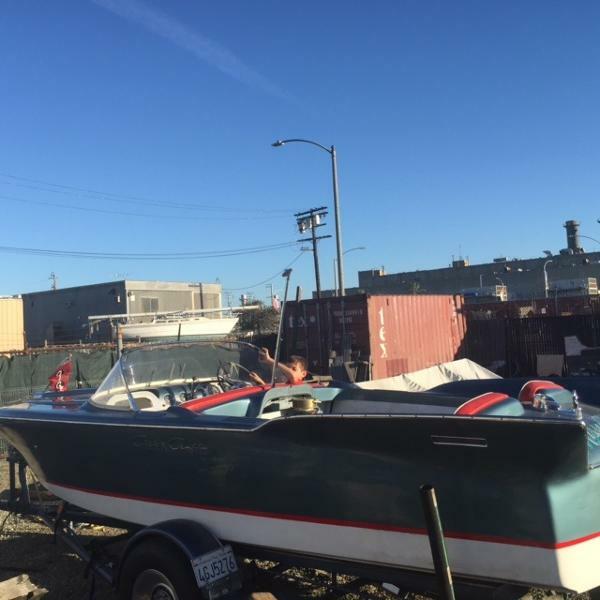 NEXT, FACTOR IN THE COST OF A COMPLETE, RESTORABLE, FACTORY ORIGINAL BOAT, VALUED AT $35K-60K. THEN, ALL SAID, YOUR TOTAL INVESTMENT WILL RANGE FROM: $110K-160K. DON'T PASS UP THIS OPPORTUNITY TO OWN A TRUE MILESTONE, INVESTMENT QUALITY, CHRIS CRAFT, WHERE SO FEW EXAMPLES EXIST, THAT WOULD DEFINITELY COMPLIMENT THE BEST OF COLLECTIONS! THIS IS ANOTHER RARE, AND UNIQUE COLLECTIBLE BEING OFFERED FROM A 50+ YEAR PRIVATE COLLECTION. THE TERMS OF PURCHASE: NON-REFUNDABLE $2,000 DEPOSIT VIA PAYPAL + CONTACT THE SELLER FOR THE BALANCE DUE PAYMENT. NOTE: ALL FUNDS MUST CLEAR BEFORE THIS ITEM IS RELEASED. QUESTIONS, AND INSPECTIONS ARE ALWAYS WELCOMED, PRIOR TO AUCTION CLOSE, BY CALLING: 559-269-9000. THE SELLER WILL FACILITATE THE BUYER WITH SHIPPING OPTIONS, AT THE BUYER'S EXPENSE. SUBJECT TO PRIOR LOCAL SALE, OR TRADE. CHECK MY OTHER AUCTIONS FOR MORE QUALITY ITEMS. THANKS FOR LOOKING! 1958 Chris Craft Silver Arrow 19' CHRIS CRAFT SILVER ARROW 1958.20k PRICE REDUCTION BY A HIGHLY MOTIVATED SELLER. A true classic. Cruise in style this summer with a rare beauty, 1 of only 92 ever made. Verification by the Chris Craft Registry at the National Mariner's Museum. In its day it was one of the most desired powerboats; with its eye catching looks and classic lines, it continues to turn heads and draw attention. This was the runabout for a 1969 Chris Craft Commander 47' which is also available from Blue Pacific Yachts. 80% restored and already valued at over $100k......Powered by a Ford Interceptor engine and rebuilt Eaton velvet glide transmission, this James Bond style boat will reach 40mph+. True classic style and power to match. 1958 Chris Craft Silver Arrow 19' CHRIS CRAFT SILVER ARROW 1958. A true classic. Cruise in style this summer with a rare beauty, 1 of only 92 ever made. Verification by the Chris Craft Registry at the National Mariner's Museum. In its day it was one of the most desired powerboats; with its eye catching looks and classic lines, it continues to turn heads and draw attention. This was the runabout for a 1969 Chris Craft Commander 47' which is also available from Blue Pacific Yachts. 80% restored and already valued at over $100k......Powered by a Ford Interceptor engine and rebuilt Eaton velvet glide transmission, this James Bond style boat will reach 40mph+. True classic style and power to match. Offered for sale is a 1958 Chris Craft Silver Arrow, Voted "Best Silver Arrow" by the antique and Classic Boat Society - Chesapeake Bay Chapter in 2012 This is hull number 003 of only 92 Silver Arrows produced in 1958. Boat was restored over a two year time frame from 2008-2010. No expense spared in a total restoration from the bottom up. The boat has maintenance free 3M 5200 no soak bottom. Has the original Hercules KFL engine installed which was rebuilt and changed over to electronic ignition with a total of 14 hours since rebuild. This might be the only Chris Craft Silver Arrow with the Hercules KFL 6 Cylinder. All other Silver Arrows had either a Chevy 283 or Ford Interceptor engine installed. This would make Hull #003 the rarest of the Silver Arrows. The sides and deck are painted with the correct Chris Craft color, automative base and clear coat, which makes the boat pretty much maintenance free. The bottom is painted with anti-foul white paint. Custom made waterline cover included and the 2008 custom tandem axle trailer is road worthy and included in this sale. This is truly a one of a kind boat, which must be seen to appreciate the details. Inspection and Survey: Survey and inspection of the boat is welcome. The boat is currently winterized in storage in Central Kentucky. Water test for serious buyers only. Payment: $500 deposit due within 24 hours of the conclusion of the listing. Payment must be received via PayPal, or check. Remainder due at delivery of boat. Cashier check, PayPal, or Money order. I will accept a personal check, but there will be a 10 day hold prior to delivery of the boat. Shipping: Responsibility of the buyer. I will help with transportation arrangements, i.e. supervised loading on your carrier. Warranty: Boat is being sold as is where it is without warranty either written or implied. If you have any further questions please don't hesitate to let me know, additional photos of restoration and current photos available upon request. As always thanks for checking out my listing.